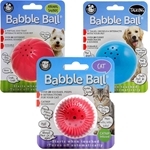 I know this site is specifically about toys for blind dogs, but I would also like for it to be a resource to those who have blind dogs and need advice and information on how to cope. 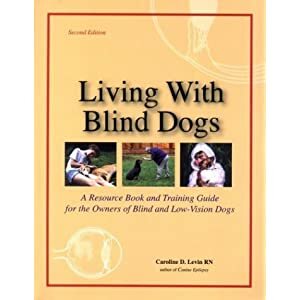 One of the best resources I’ve come across and have found highly recommended by vets (including our dog’s ophthalmologist) and dog owners alike is Living With Blind Dogs: A Resource and Training Guide for the Owners of Blind and Low-Vision Dogs by Caroline Levine. It is one of the few books on the topic and one of the best. Dealing with dogs blind from birth or both blind and deaf. Probably the most important things we got from Living With Blind Dogs was the information on how our dog would react to her blindness, how to help her navigate (one method is with scent markers, which we’ll be reviewing soon), and playtime. I think we took our dog’s blindness harder than she did, though she did experience a period of stress and depression for a few months. Caroline explains how dogs react in her book and she was spot on with her assessment. Our dog followed the familiar patterns Caroline explained and our dog ultimately ended up adjusting quicker than we did. It was a difficult time for all of us, but I’m happy to say that things are as “back to normal” as they can be and we have a happy, well adjusted dog. For a while, our dog navigated expertly and we wondered if she didn’t have some eyesight left. However, we’re sure she’s completely blind now, as she does run into walls and bounce off obstacles (earning her the nickname “Pinball Pup”), especially if she’s excited and eager to get where she’s wanting to go. We’ve learned through Living With Blind Dogs to leave clues for her to help her navigate, like specific textures on the floor or scents on the door frames, steps, or other obstacles. Our dog has always been incredibly playful, so it was imperative that we help her find a way to continue doing what she loves. Caroline’s book gives great advice on toys and games that will keep your blind dog happily occupied and fulfilled. 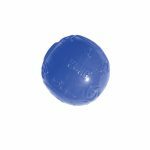 I’ve shared several of those types of blind dog toys in reviews on this blog, but you don’t need toys to help your dog play. One of our dog’s favorite games (because it involves food) is a variation of the game Caroline calls “Follow the Food Trail”, in which you lay down a trail of treats for your dog to find and follow. Since our dog has a bit of a weight problem due to her SARDS, we have modified the game a little bit and “hide” one treat at a time in a room for her to find. Usually, the treat is in plain sight to us, but it sometimes takes her a while to find it, especially if she’s so excited about getting the treat that she has a hard time focusing on actually finding it. If there’s one book you get as a resource to help you with your blind dog, Living With Blind Dogs should be it. 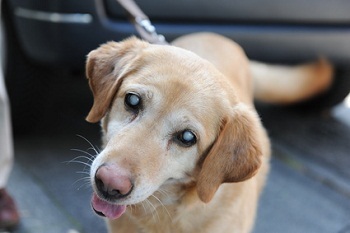 It will reassure you that blind dogs can live a happy and fulfilling life and will give you the knowledge and tools to help your dog do just that.